Like most of his contemporaries, 19-year-old Avikesh Kumar has yet to declare with certainty what he sees himself doing in 20 years: he knows he does not want to be a politician albeit an ambition to effect social change. "I don't see myself becoming a politician; you do not have to be a politician to make things happen," he says resolutely to an enquiry seeking to establish if he was heading that way, considering his intentions for a career. For starters, Kumar is making things happen from a very personal level: he is switching from his vet science studies to a social work and psychology programme at a different university. "I know that this is what I want to do, to be more involved in advocacy," Mr Kumar who was one of the speakers at the Inspirational Stories Collection talanoa session on World Population Day (June 11) said. Mr Kumar told students who had gathered for the ‘Investing in teen girls'-themed talanoa event that he had lacked awareness in advocacy and social justice when he was still in high school. However an event at his Fiji National University campus changed all that after realizing that he wanted to be part of social change movements; that there were issues that not only interested him but he saw himself being an active advocate for. "The decisions we make, make us; we are made of our struggle," Mr Kumar told students while sharing his own experiences as a student and young person navigating the different spaces within which he exists, and his various approaches and worldviews on practices like arranged marriages. "We all struggle as youth with whatever issues we are facing but we can help each other: whatever we decide will affect our future. "Boys, we have a major role to play especially when it comes to gender equality: we need to stand up for girls. I am not perfect but as I grow older, I don't want to do these things anymore," the 19-year-old said. Mr Kumar encouraged young people to inculcate a culture of knowledge-seeking, particularly in terms of issues young people grapple with as part of growing up in our island homes, imploring their sense of responsibility. "I am glad you are here to be part of this discussion, to broaden your knowledge because as youth, you have to understand them," Mr Kumar said. "As youth, boys and girls, are pushed aside because they say we do not have the knowledge but we know! It is important that our voices are heard - we are the ones who are going to be sitting in Parliament tomorrow. "Go from here and talk about what you've heard and learnt. I know not everyone will be supportive but at least the messages will be out there. We have a lot of work to do as youth - priority though is to start. "We matter. We should speak our minds." 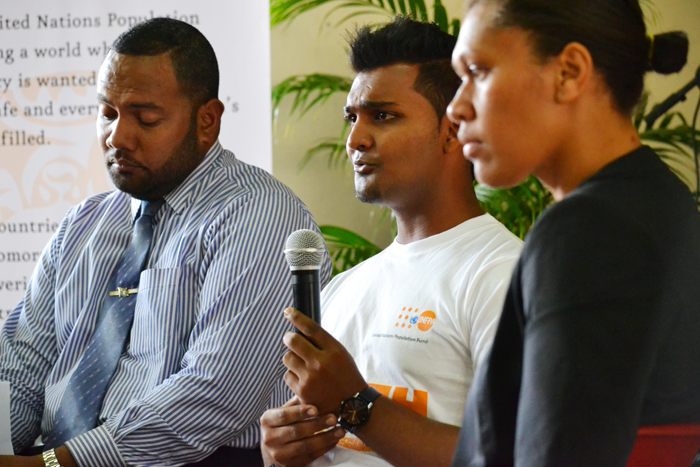 Fiji's National Youth Council president Wiliame Nayacatabu acknowledged the role of the United Nations Population Fund, UNFPA, in convening a gathering where speakers shared different experiences of pursuing their professional journeys, in the context of the importance of investing in teenage girls. Mr Nayacatabu also acknowledged the UNFPA's role as an international platform which supported work towards the empowerment of girls and young women. "I must also challenge all leaders of Fiji to take a bold step in investing in our teenage girls and urge all youth, students to join a youth group or club in your communities and get registered to be part of your national youth council," Mr Nayacatabu said. "The national youth council was established to be our voices to government and to our stakeholders. We will continue to be the voice of the youth in our nation." Apart from Mr Kumar and Mr Nayacalevu, speakers who generously agreed to speaking roles at the inspirational stories collection talanoa included dual Fiji representative and current Fiji Pearls player, Lusi Biukoto, senior economist with the Reserve Bank of Fiji Lanieta Rauqeuqe and from academia, University of the South Pacific teaching assistant Jope Tarai. Permanent Secretary of Youth and Sport Alison Burchell also spoke to the gathering emphasizing the potential impact of curiosity, urging young people to question occurrences around them as curiosity can be the progeny of a positive and empowering experience for individuals, particularly teenagers. Curiosity and the thirst for knowledge which can be quenched to some extent by questioning practices that inform our world views, can also inform transitions students were told, be it a personal or a national one. The importance of evolving attitudes and mind-sets, Ms Burchell said was the importance of having an open mind to innovative approaches during transitions. Male students were reminded of their critical role in changing behaviour which would contribute to the creation of an enabling environment that would facilitate empowerment for their female contemporaries to make informed choices and realize their full potential in education, in their profession, etc. Speaking from the heart, Ms Rauqeuqe stunned students when revealing that she had failed secondary school finals Maths, a situation that did not deter her from pursuing economics at the University of the South Pacific and passing applied Mathematics in post-graduate studies. Ms Biukoto who is the only woman in Fiji with a masters in global sports management, apart from her Bachelor of Arts in Information Systems in Management and a Bachelor of Arts Commerce in Tourism Management. She encouraged students not to be restricted with perceived ceilings: "Push yourself above the limits, never settle for less," she told students. University of the South Pacific teaching assistant Jope Tarai made reference to ideals described by Mahatma Gandhi in his statement "Your beliefs become your thoughts; Your thoughts become your words; Your words become your actions; Your actions become your habits; Your habits become your values; And your values become your destiny." Mr Tarai challenged students to contextualize the ideals and inculcate them as part of their lifestyle. "Let us make investing in teenage girls being critical thinkers and actors part of our thoughts, actions, habits, values and most of all our destiny," Mr Tarai told the students. "For who else can make this a reality but you the teenagers? You the future of Fiji, the leaders of tomorrow, the voice of today." WPD, as a United Nations calendar event, was triggered when the number of people in the world reached 5 billion. The event was established in 1989.